I really enjoy things that do double duty. Lamp that organizes? Neat. Spatula that also plays music? Awesome. 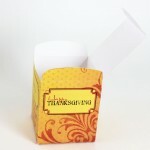 Thanksgiving Favor Box that can be used as a place card? Super cool! This box is very simple to put together. 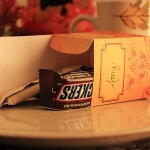 It requires just a smidge of glue, and the bottom folds to hold itself together. 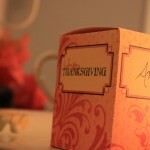 On either side there are Thanksgiving greetings and on the front there is a blank square. 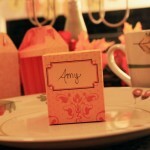 You could leave the square blank, and have a bunch of them on a welcome table as guests walk in. 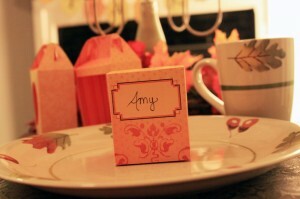 Or, you can use that space to write the names of guests, and use the boxes as place cards at the dinner table. The template is available in my Etsy Store. Cut on the solid lines, score on the dotted lines. 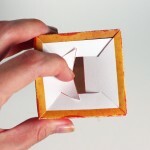 Glue tab a to the inside of the box face directly opposite it. Tuck the smallest bottom flaps in, followed by the longest. Tuck the larger flaps into the space created by the smaller flaps.